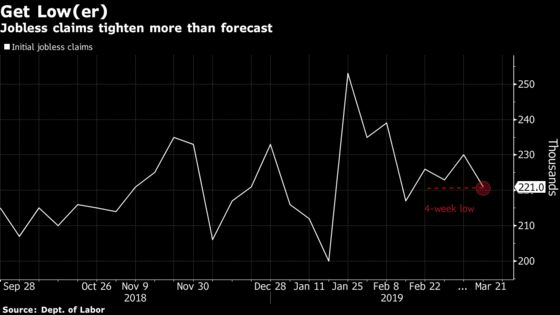 (Bloomberg) -- Filings for U.S. unemployment benefits fell more than expected to a four-week low, as the labor market tightens further following the end of a five-week government shutdown. Jobless claims fell to 221,000 in the week ended March 16, beating economist forecasts for 225,000, Labor Department figures showed Thursday. The four-week average, a less-volatile measure, ticked up to 225,000 and has steadily increased since October. Continuing claims, which are reported with a one-week lag, fell by 27,000 to 1.75 million in the week ended March 9. The previous week’s claims were revised up to 230,000 from 229,000.